Part 3/3 from Jayant - insightful piece on Price Pack Architecture to optimise portfolios. From whatever I've seen, this is one of the most effective parts of the Revenue Growth toolkit. Most consumer decisions are made within the influence of several factors – price, competitive marketing efforts (media and trade promotions), brand significance, share of mind/shelf in the shop/retail, new innovative launches etc. So how can a researcher decide on a methodology that allows us to study the impact of these variables when optimizing a brand portfolio. Price Pack Architecture is important to ensure that each SKU in a brand portfolio is aiding in maximizing volume and value for the parent brand (with least cannibalization). Since each SKU would differ slightly in its offering (size, price, flavor etc. ), it needs to be understood what impact does it have on the business by changing or introducing new SKUs or brands in the portfolio. Conjoint is one of the most commonly used research tools to study the impact of different PPA scenarios, e.g. · what would happen if we change the size (grams) of one of our SKUs? · Does a 10-cookie pack cannibalize my own 5 cookie pack or take from competition? · Does reducing price by $1 hep increase volumes enough to bring more revenue? Collecting data – The exercise is simple – each respondent is shown a series of scenarios with different brands and SKUs at different price points. These SKUs and price points vary for each scenario. We may show some brands and SKUs in some screen and not show in another. The same SKU can have a variation of price points (generally defined as +10% or +5% of base price). Then for each scenario the respondent is asked to choose an option they would most likely buy (assuming this were a real purchase). To make the scenario true to reality we sometimes also offer an option of “none/buy something else” to allow the respondent an option to reject all options in a scenario. Below is a screen to illustrate a survey screen. 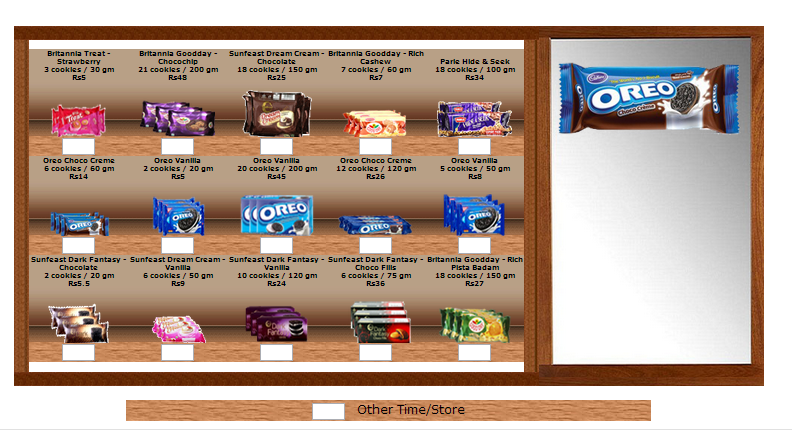 Generally, a respondent is exposed to 10-15 such screens depending on the number of brands/SKUs we are testing. 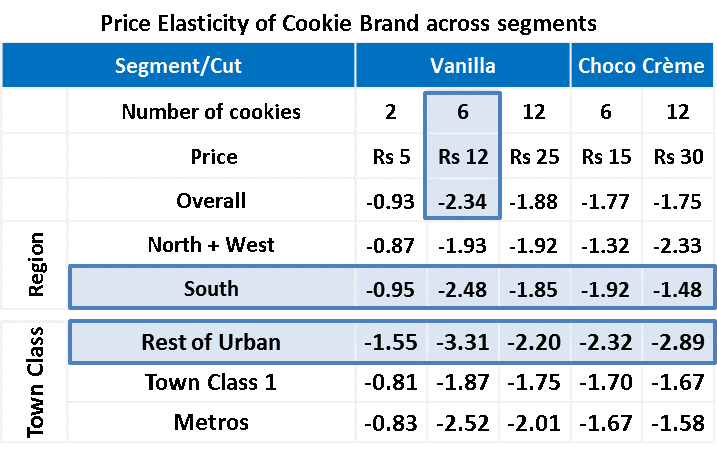 • Price sensitivity analysis is done to determine Optimal price points: Below is an example of a price sensitivity analysis – it shows that if everything in the market were to remain constant, how would our brands value and volume sales change if we alter the price. The slope of this curve is called price elasticity (i.e. the change in value/volume sales if we change the price by 1 unit). 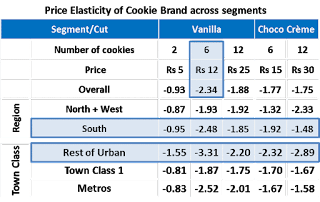 Brand managers desire to have price in-elastic products (i.e. very small price elasticity ~0). A low-price elasticity would indicate that the brand doesn’t lose sales as we increase price. Running different permutation and combination of such scenarios will then help estimate gain/loss to portfolio, thus deciding an optimal portfolio. We can also create scenarios where the competition prices and launches can be presumed to predict different “what if” scenarios.